If you are a self starter with big goals and a love of helping others achieve their dreams, now is a great time to learn about joining the iCandy Realty team! Keep more of your commission this year with our 100% commission model! Pay as little as $6,000 per year total at 20 Transactions! 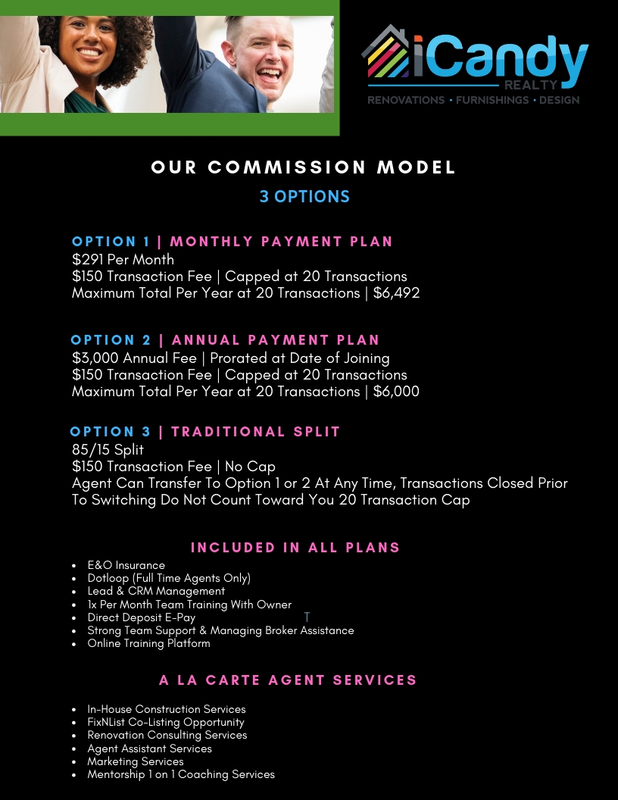 See below for your commission options & all the features & benefits we include! Email our office manager, Jessica Adderley, to get started today! Jessica@icandyrealty.com or Call 708-255-0200 for more information! iCandy Realty offers the best agent services to help our team succeed in the exciting and competitive Chicagoland real estate market. As an iCandy Realty agent you will have access to specialized training, exclusive access to our Fix-n-List program & team, cutting edge listing strategies, team trainings, and a family team culture which will help to motivate you to achieve your greatest goals. Take your career to new heights and become part of the most innovative real estate team in Chicagoland! We offer our clients services that no other brokerage is offering, get the advantage! !